There is a town, a part of Charlotte County, that will catch and keep your attention. 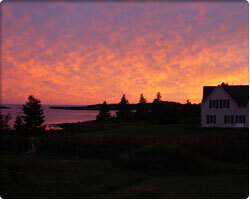 St. George (Granite Town) lies between St. Stephen and Saint John, a thirty-minute drive from Calais, Maine. There is much to do at St. George. You might rent a canoe or kayak to ride atop the Magaguadiavic River. Paddle to Lake Utopia with its only natural canal anywhere – hike to Lake Utopia with its sandy beach. Long Water and Canal beaches are also in this area. Take in St. George’s famous gorge and falls. Why not explore St. George with its modern hotels, country inns, camping sites, and more? St. George experiences some of the highest tides in the world. Generations of fishermen have called St. George ‘home.’ The sight of herring weirs proves the generations. The largest aquaculture industry in North America is to be found here. You may buy seafood, fresh from the days catch – lobster, scallops, and clams. Follow signs to L’Etete and board the ferry for one half hour. You’ll step ashore at Deer Island, one of the three enchanted Charlotte islands. While there discover the ‘Old Sow,’ the largest whirlpool in the western hemisphere. By taking the road out of St. George to Bonney River, a beautiful, peaceful drive, you will soon reach Black’s Harbour – home of the world’s largest sardine industry, Connors Brothers. 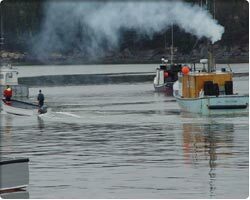 Black’s Harbour has a long history of fishing. Black’s also boasts a modern aquaculture business. At Wallace Cove, ferries await to take on passengers to Grand Manan – a two-hour ride, with all eyes watching for whales, porpoises, and other marine life. At Beaver Harbour, the smooth but narrow road snakes near the shimmering water of the Bay and leads on through the village. A church with its tall, white steeple sits on a hilltop overlooking the water where fishing boats are gently bobbing. As you follow the road through Beaver with long country lanes that lead to cozy homes, the serenity of the village has its affect. Too soon one is once again out on Highway 1. Pennfield stretches before you, flat and straight with blueberry fields alongside. During World War II there was an air force base and a landing field here. Watch for an Irving gas station (with a restaurant) open round the clock. Across from it is Comeau’s Restaurant and Groceries. Try their fish and chips special. Smith’s Restaurant and Motel (locally called Smitty’s) is ready to serve you. If you want the best steaks for large appetites, stop at the Fundy Mini Mart. Hawkins’s Blueberries and McKay’s, which have blueberries and blueberry pies, fresh daily, to tempt your taste buds. Card’s Aquaculture is also located at Pennfield. They make fishing nets, etc. At Seeley’s Cove, periwinkles and mussels are plentiful, also dulse, that Maritime treat that can be picked until August. Seeley’s Cove is off the highway but signs are posted. Beach combing is a pleasant activity at Seeley’s Cove. Pocologan was named for a long ago Indian chief and is the halfway point between St. Stephen and Saint John. To really experience Pocologan you mustn’t miss the half circle Pocologan School Road from Highway 1 – 300 metres from The Clipper Ship Motel and 500 metres from The Bay Breeze Restaurant. The Fundy Line Motel and Ocean View Campground are located here. Down the half circle road is the old school craft shop – The Salt Water Gallery Craft Shop. The Pocologan Bed and Breakfast sits nearby. 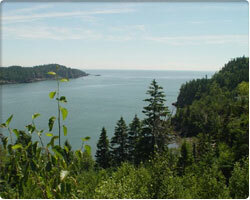 At Pocologan, the Bay of Fundy view well qualifies for picture taking and sheer enjoyment. Road signs announce New River Beach, a provincial park and a ‘for sure’ stop. The tangy, salt air, the pounding waves, the squawk of passing sea gulls, sugar sand, a far bank of sea weed – it’s beautiful here! Have a swim! At New River there is a campground and Barnaby’s Head Trail that runs about six kilometres. Road signs lead you on to Lepreau – a friendly little village. If you need groceries, gas, a quick lunch, a cold drink, or to mail a card or letter, stop at Barry’s – Lepreau Quik Mart. The Pizza Shack it contains has the very best pizzas and fantastic hot dogs. Digger’s Lounge follows a little further down the road. Digger’s has a licensed dining room. At Digger’s, the village and world news blend in lively conversations. 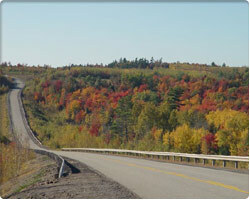 Lepreau offers a provincial park with a picnic area. Lepreau Falls flow from the Lepreau River. The falls bump along lower and lower flat surfaces until they bound, with a fantastic roar, over a great, rocky ledge. Lepreau Falls is the pride of residents. They still argue over the origin of the name – it may have been Indian or French. Drive on down Little Lepreau Road so you don’t miss the cut-off fishing villages with their spectacular views of the Bay of Fundy that often runs alongside the highway. Lots of photo opportunities! On entering the Little Lepreau Road, you are in 790 territory. As you travel though Little Lepreau, one of New Brunswick’s many covered bridges, the Mill Pond Bridge, sits across from the regular bridge. Soon Charlotte Shellfish Inc. and Lomax Marine Construction come into view. Lomax is involved in wharf work – anything involving diving and underwater videos. Continue through the village to the Harbour or Mac’s Beach – the road forks. Mac’s Beach is a rough beach with a hard-packed sand area. It looks out to Saulkils Island. At low tide one may walk from one island to the other but at high tide it becomes two separate islands. It is locally called ‘The Sisters.’ The Harbour is populated, but it remains a peaceful sight where the great Bay holds fishing vessels, gulls fly above all and the long wharf adds to the serenity of the scene. Retrace your steps through Little Lepreau and cross the Maces Bay Bridge to where a wide expanse of the Fundy lies in view. Traffic moves at a comfortable pace and pleasant homes are nestled alongside. Banks of brown rock crouch close by. A church steeple points skyward. Following Maces Bay Road and off Welch Cove will lead you to the site of the world famous Point Lepreau Nuclear Plant. Most of Maces Bay has steep banks with little beach access. 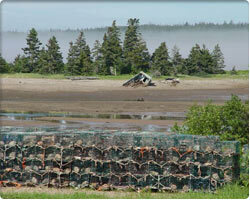 From the Maces Bay Road, you can walk onto flats, pick clams or ‘winkles’ in season or gather dulse – but watch the tide! It can close around you! Maces Bay continues 790 territory. Slipping into Dipper Harbour, a slightly twisting roadway will lead you onward to the busy village. Signs will direct you to the Fundy Haven Restaurant, which will prove an enjoyable experience, excellent food, and a great view. Dipper Harbour abounds with spectacular views. Have your camera ready! The Fundy awaits, posing everywhere. At Dipper you will experience Fundy Bay Sea Food, Polar Foods lobster pound where you can purchase live lobster, Harley’s Misty Harbour Sea Foods – a sea food store. Try the clams or fish cakes – a variety of seafood. At the Dipper Harbour wharf there is a mooring space, a breakwater, and a boat ‘haul out.’ This shore road is often called the scenic view of the Bay. By following 790 signs, one arrives at Chance Harbour. Mawhinney’s Cove Road leads you to The Mariner’s Inn with its beautiful, natural setting. The sight of the Bay of Fundy directly behind it will leave you breathless. Perhaps a whale or two will disturb the silvery water. Comfortably seated in your deck chair with a cold drink and your shoes off, a leisurely peace will settle and soothe. 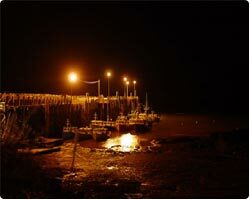 The Chance Harbour wharf provides a view of the Bay and a chance to meet local fisher folk. There are a couple of accessible beaches. The Minor’s Store is on the Chance Harbour Road. Nearing Musquash you will come upon Robichard’s Lumber Mill. Beyond Chance Harbour is the village of Musquash with its power plant and Ducks Unlimited Marsh, the most ecologically diverse marsh in North America, surrounded by man-made dikes. Musquash is ideal for bird watching. The Trans-Canada Trail runs through here. The little village is certain to fill you with that peaceful, ‘away from it all’ sensation. Evening begs the question of where to spend the night. The answer comes easily – back to The Mariner’s Inn with its comfy, home-like atmosphere, delicious meals, and best of all – the view from the Inn that soothes like no other!